At a celebration, I was exchanging small talk about what I did for a living with another guest. At the mention of my involvement with the martial arts, he asked if I taught classes. Hmm. Was he asking about taking lessons? His answer was a little puzzling; occasionally, a small percentage of the population responded negatively to my mention of Bruce Lee or martial arts, but I had never had someone get angry about teaching self-defense. After calmly querying this guy about his response, he told me that he had been fleeced by a big-school operation. They got him to pay the first month’s fee, the last month’s fee, a deposit, AND … he had to pay for his uniformS (they insisted that one be clean, at all times), his belt testing, his belts, and more. They also charged for their in-school competitions. And all of this wasn’t cheap. Plus, they had a contract that obligated him to a year at a time! This was the epitome of a Commercial Operation. And it left a bad taste in his mouth! That Kind of Commercial Marketing Leaves a Bad Taste in My Mouth, Too! I had to assure the guy that first, there wasn’t going to be any sale pitch for my classes. In fact, at the time, I wasn’t even teaching. And I told him that some of those “mall operations” had a lot of overhead, which forced them to go, as Frank Zappa sang, Strictly Commercial. He asked about class prices, when I was teaching. He thought that my monthly fee was a low figure … there must be a catch. So, he asked about my … first, last, contract, and deposits. We talked a bit more about my brand of martial arts and self-defense. He wanted to sign up for classes, right then and there, but as mentioned before, I wasn’t teaching. I’m Not In The Business to Fleece Students, Are You? have lost the personal connection with their students. To these teachers, martial arts is all about money, and it shows. Ugh. 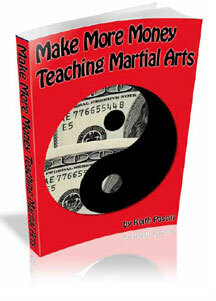 How Do You Make Money Teaching Martial Arts? I didn’t really consider my methods to be secrets … simply my way of earning a living while making it a win-win situation for both student and teacher. Still, this one martial arts teacher on my list was desperate. He didn’t have enough students to survive and he wanted my help. I agreed to give him a little coaching; in my mind, he needed help through the process of filling a class to capacity. Maybe after modeling a class-fill, he could be turned loose to replicate the process on his own. 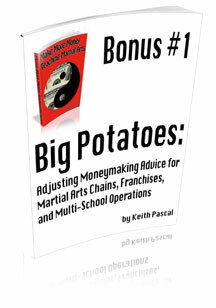 It took awhile, but I compiled this epackage to help you make as much money as you need by teaching martial arts. “I have always enjoyed your down-to-earth information and tips and this was no exception. 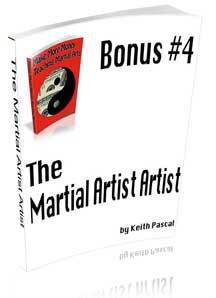 “This book has a shotgun effect of ideas that everyone in the business of teaching martial arts will find beneficial. More Testimonials toward the bottom of the page. Scroll down. First, we’ll talk numbers; this is the time to be frank … honest with yourself. You’ll quickly see how making money doesn’t have to be scary or mysterious … or unethical. From there, we’ll move into setting the best price for classes, even if you already have students who pay a specific price. I’ll show you how to find the sweet spot — the perfect price that makes you money, attracts the right students, and is an amount that your students can afford. In the third chapter, I’ll show you four moneymaking models. These are the methods that my peers and colleagues use to make good livings, without having large schools. (In one case, the school is bigger than a one-person operation, but we’ll focus on a sideline he uses to make over $4,500 EXTRA per month. Both Chapters 5 and 6 are chock full of extra methods for adding money to your bank account. Some of them you will have thought of, and some of these moneymakers will be completely new to you. Finally, in Chapter 7, we’ll revisit some of numbers. With all this newfound knowledge — ways to make more money teaching martial arts — you need to see how it can all fit together into a sane, very doable … nice income. Remember, none of this is from anything found on the Internet. 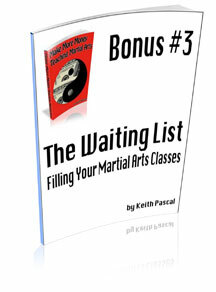 These are direct-experience, first-hand ways to make money with your martial arts teaching. No wonder the younger martial-arts teachers don’t think ebonuses are worth the computer memory to store them. Well, my ebonuses are different. They are logical extensions of the main ebook. Each was written specifically for this epackage by me,Keith Pascal. Each one contains extra pieces of information that you might need to ensure your success. You’re not out of luck if you do own a big school. Not all big operations are slimy, by any means.You can still use these methods to make more money … ethically. This epackage doesn’t have to focus only on the smaller potatoes. This ebonus will show you how to scale up some of the suggestions, and it highlights a few ideas that are specifically suited to the big guys! Take what you like from it, and leave the rest to the more commercial operations. I really don’t want to turn you loose with a bunch of random, scattered ideas. My focus is always on bringing the different elements together into a workable, nice income. The problem is that you don’t want to run around like a chicken with her head cut off. You need a sane, relaxed approach to combining different moneymaking elements of your career. Read this ebooklet for some answers on developing your ideal work style. And I really do hope that I have put a new, interesting twist on this subject. Chapter 4 of the main ebook doesn’t cover the subject in enough detail on filling your classes (IMHO). There’s still more to be said … and some different ways to keep the funnel full. Chapter 4 deals with one target audience for your classes; this ebooklet focuses on a different group. Together, you’ll learn to choose your own perfect group, and definitely fill the class. If you haven’t tried this method, you really are in for a treat. And then you’ll wonder why others have such difficulties. eBonus #4: Just back from layout, it’s ready to go. 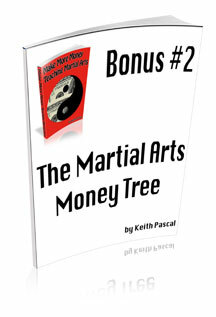 The Martial Artist Artist (22 pages) will show you a method for making more money with your art. You also learn how to determine the best martial themes for your arts and crafts, how to sell high-priced art, and you’ll discover how to test for subjects, so that your target audience of martial artists will crave more. How Much Is This ePackage? Let me ask you, seriously … honestly … and frankly, how much would you really pay to ramp up your martial-arts teaching business to where it made you a good income? On the other end of the scale, I’m guessing you couldn’t afford $1,000 – $2,000, no matter how good the info. is. If you don’t have the money, then you don’t have it. Right? I wanted the price to be $99 … not too expensive, but not too cheap, either. The right fit for the right teachers. Some of the other parties representing the company did internet research and found that $67 was a popular price. How would you like to get your copy for a lot less than that?